It’s berry season – yay! Actually, we’re coming to the end of strawberry season (which was late this year), and tiptoeing into blueberry, blackberry, and raspberry season. Now’s the time when the berries are ripe, and sweet, and bursting with flavor…not to mention way cheaper than any other time! So it only makes sense to stock up. 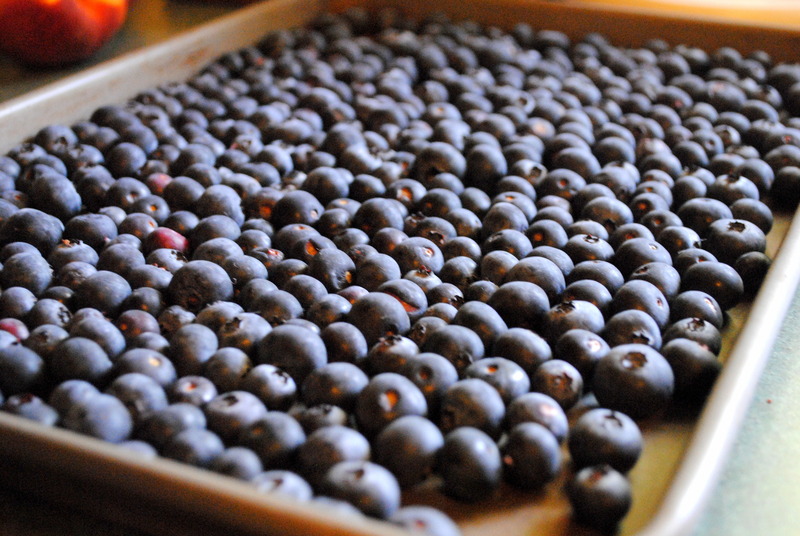 In order to do so, I like to freeze berries, especially blueberries, so we can pull them out any time we want for a healthy, flavorful addition to cereal, pancakes, smoothies, salads, baked goods, whatever! It’s really easy to freeze berries, but you can’t exactly just plunk the pint in the freezer and walk away. I have a simple method that allows the integrity of the fruit to be preserved and keeps them from sticking together in one big clump. We love blueberries at our house, so I’ve done this several years now with them. 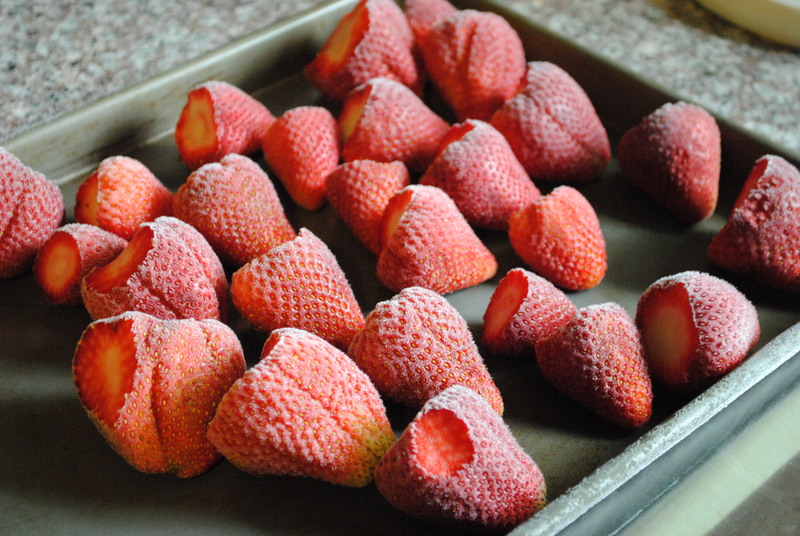 This year, I also picked up some beautiful strawberries and froze them the same way. I haven’t done blackberries or raspberries yet, but when I see some for a good price, I’m going to pick them up and freeze them too! 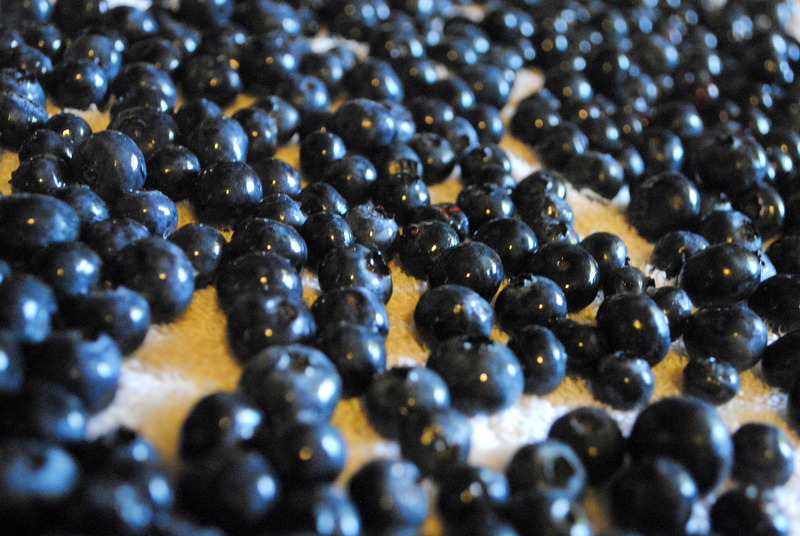 The first thing you do is wash the berries and lay them out to dry on a clean kitchen towel. (If you’re working with strawberries, hull them.) Once they are completely dry, spread them out in a single layer on a baking sheet. (It’s a good idea to test the empty baking sheet ahead of time to be sure it fits in your freezer easily and stays level.) 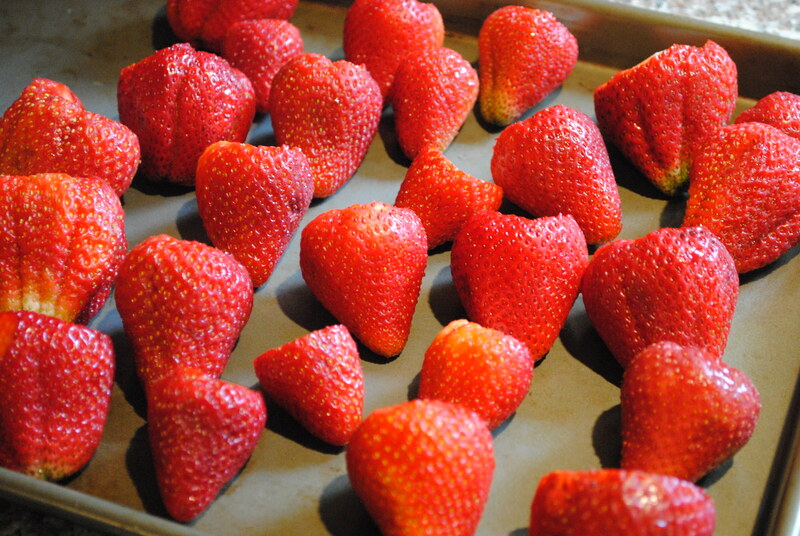 Then, place the baking sheet in a level place in your freezer, and allow the berries to freeze completely. I usually just leave them in for a day. But don’t leave them too long, after all, they are in the open air. You want to get them in a container so they don’t get freezer burned. 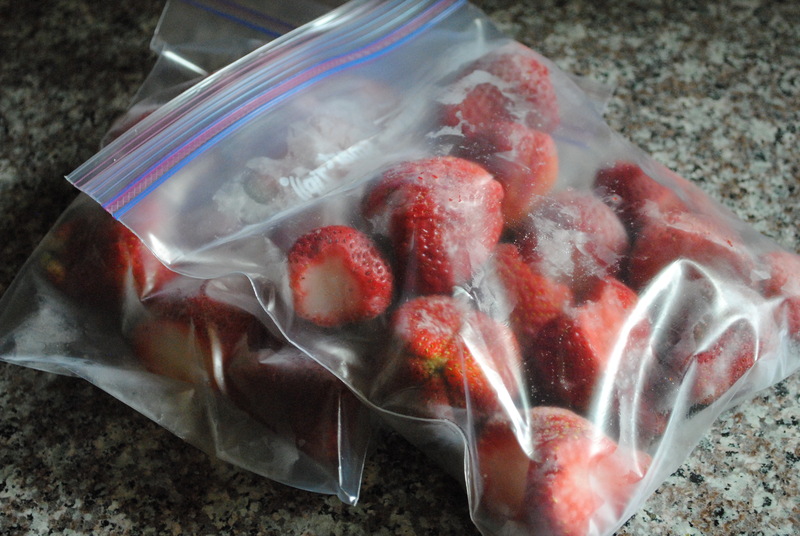 After the berries are fully frozen, portion them out into freezer zip top baggies and remove as much air as possible. The quart size seems to be convenient for us. 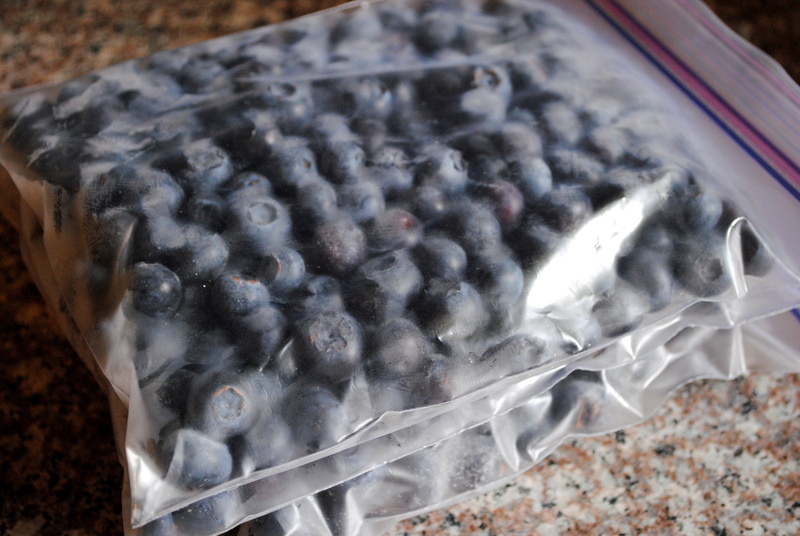 Label and date the bags, then lay them flat in your freezer for easy retrieval. Then, you can just pull a few berries out as you please and enjoy the delicious, ripe, flavorful fruit for months! It’s much cheaper than buying frozen fruit at the store, and much better than overpaying for out of season fresh fruit that lacks flavor. So when you’re at the Farmer’s Market or you see a good price on berries at the store, pick up a few pints and give this method a try! I promise, it’s easy and you’ll love it!